Love this, great fit, easy to use ratchet quick release chin strap, and to flip up compared to other helmets I have tried. Added Benefit of a drop down sun visor that retracts at the touch of a button. Very little wind noise and looks great!! Love it! Bought this over New Year as a replacement for my AGV Compact. I followed the advice of other reviewers and bought Large (head measures c.58-59cm). Fit spot on, easy to install Scala Comms kit and helmet well made. I like the air flow system and noise not bad (wear ear plugs anyway). Pinlock ready, but needed to buy the insert separately. Delivery per promise - good job. I like the style and the fit is very comfortable. Don't be afraid to try different helmets. This was my third try (my fault) and I'm glad I persevered. Guys at SBS were very helpful. With the nights drawing in I was conscious that my black helmet made it difficult for me to be seen by other road users. I had seen on the .gov website that Sharp (the organisation who test helmets for safety) had given this helmet five stars and at the price it was at SBS it was a no brainer to buy it. I have a medium sized helmet which is very snug (almost tight).The Pinlock is great for preventing the visor fogging up and the helmet has better ventilation than my former Airoh helmet. It is also a lot quieter so all in all I am really pleased with my purchase. SBS customer service was, as always, superb. I wasn't after a flip front helmet but I tried this one as well as traditional full face helmets at SBS. It's a really nice helmet good sun visor that goes into 3 positions, lightweight, worn it for 2 hour ride felt comfortable. Noise is not too bad but I do use ear plugs. I would buy another. And the support and handling was super! I do like this helmet overall. It is comfortable and has a good flip locking mechanism. My only criticism is the sun visor (or sun film). When down the view through it is slightly distorted. It feels either too thick or maybe the convex shape of it distorts vision. My previous helmet had good vision through the sun visor so I am comparing against another version. Good delivery and best price on the web from Sportsbikeshop. I should have taken heed of the reviews and went one size larger. Never mind the exchange service from SBS was top notch. The item is good. Easy to open n close the front. Closing the visor was a bit lopsided from time to time. Sunshade is useful and I hope it lasts the usable life of the helmet. Overall a good buy for me. 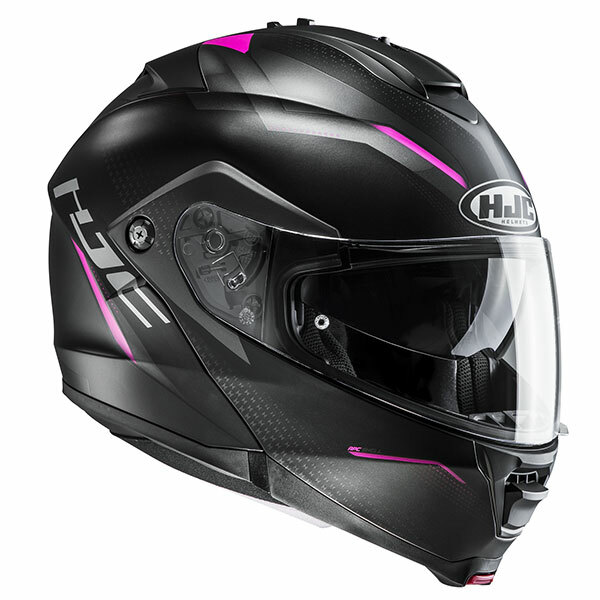 Good helmet for 1st timer's, snug fit, lots of great features, including Pinlock visor, and not too expensive. Sizes are a bit tight... I'm usually a Medium but the Large HJC was a much better fit. Not only is the helmet stunning to look at it fits very snug but comfortably. One thing that was particularly helpful is the ease at which you can open the front. I did end up returning the Small for a Medium because I felt the padding squeezed my cheeks up a bit. I would highly recommend this helmet. Great helmet, great price and speedy delivery! As per the other reviews, the sizing is quite snug; I ordered a Medium but I found this very tight around the top of my head and so changed to a Large. Helmet is very comfortable and has some great features, including the Pinlock visor and flip-down sun shade with quick release. All-in-all a very good lid! This helmet is excellent value for money, one of the top 5 Flip up helmets with features equal to others much more expensive. Buy it from here because the price, delivery and service are top notch. My previous flip-up helmet was cheaper than this and naturally lower quality. Got this one as I read good reviews about it and i'm not disappointed. It's definitely quieter than my previous helmet, although this could be improved if I wore earplugs. I find the helmet and padding very comfortable and a snug fit which makes wearing my glasses much more bearable over long distances. For the price, the quality is great and I can't really fault the helmet so far. Arrived promptly as ever from SBS, currently have a Shark full face(L), so bought a large in the HJC which seems a little snugger than their sizing I believe, lovely looking lid and road noise seems no worse that the Shark FF....surprising. Really comfortable with glasses for all the bespectacled brothers and sisters. Nice ratcheting/ quick release feature on the sun visor and a nice little surprise comes with a clear Pinlock visor. Will get a proper road test in a few weeks but so far, well pleased!